Job interviews can be very stressful. Practical tips for interview success include simple techniques for overcoming job interview nerves and reducing your interview anxiety. Poor interview performance as a result of feeling tense and nervous is one of the most common challenges candidates face. Knowing how to control interview stress builds your confidence which leads to better overall interview performance. Take these six steps to feel confident about your job interview. One of the best ways to reduce nerves is to be prepared for your interview. Find out what you can about the company. Practice your answers to common interview questions and be ready to explain any tricky issues on your resume such as employment gaps and reasons for leaving. Before the interview think about the things that worry you and put some coping mechanisms in place. Making a list of what needs to be done helps reduce stress. Prepare a list of what to do the day before your interview and check the items off as you complete them. This way you can go to bed the night before the job interview knowing you have prepared everything and get a good night's sleep. Be confident that you will look the part and make the right impression with your interview attire. Check your clothes are clean, pressed and tidy. Polish and clean your shoes. Try out the way you will wear your hair. If you look good, you will feel good. Before you leave for your interview you can use visualization techniques to help you relax. This involves closing your eyes, breathing deeply and picturing yourself confidently and calmly greeting the interviewer, answering the interviewer's questions fluently and establishing a good rapport with the interviewer. Remind yourself that the interview is not an interrogation, the interviewer wants to see you succeed. On the way to the interview and while you wait practice smiling! Smiling releases endorphines which the body uses to reduce stress. Take a deep breath, slowly breathe out and smile. Practice sitting in a position that you feel comfortable and confident in with your hands held loosely in a relaxed fashion. To overcome interview nerves during the interview breathe deeply and regularly. Keep your posture straight, with your legs crossed at the ankles or feet flat on the floor. This ensures you come across as relaxed and composed. Hunching in your chair or crossing your arms or legs makes you look nervous. Be aware of signs of anxiety during the interview such as jaw clenching or face rubbing and correct these. 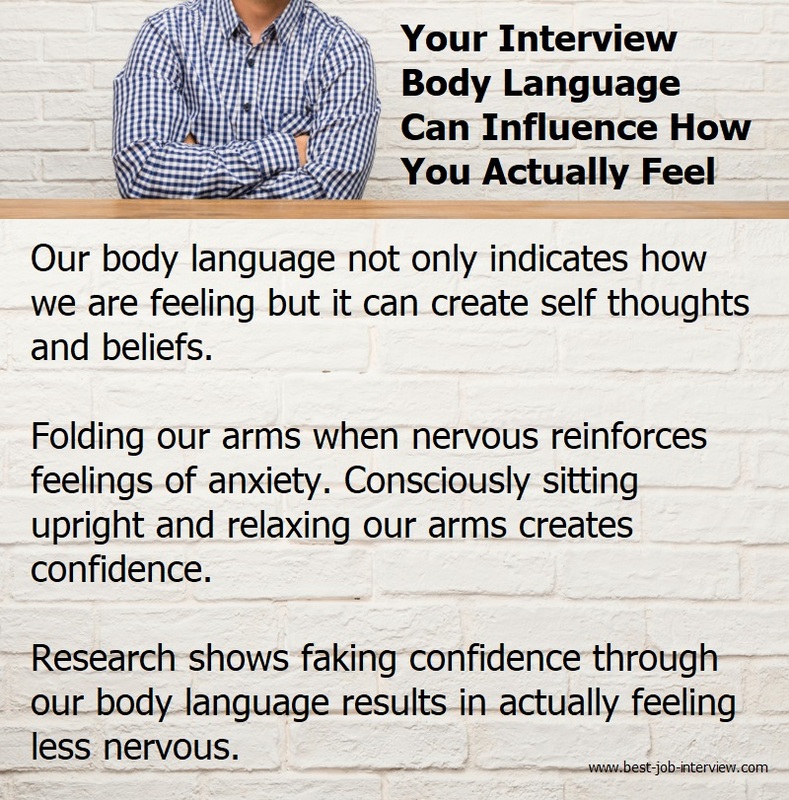 Acting and looking confident by sending the right message with your interview body language, even if you are not feeling confident, helps you to feel in control. Your posture, what you do with your hands, looking directly at the interviewer and maintaining eye contact will affect your mindset and how you perform in the job interview. 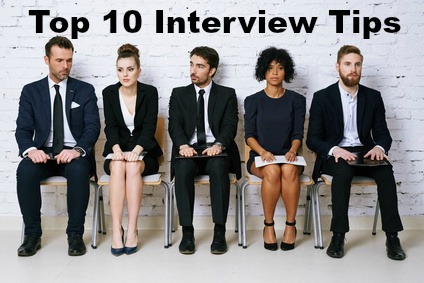 One of the best tips for interview success is simply to pause before answering questions. This gives you a chance to breathe and organize your thoughts. Speak slowly and calmly. If you feel yourself starting to panic, pause and take a deep breath. Regain your focus and continue. The interviewer will not notice a quick 10 second pause and this way you get your nerves under control before it gets worse. To succeed in your job interview it is important to make the right impression from the word go. Make a positive impression from the moment you arrive for your interview. 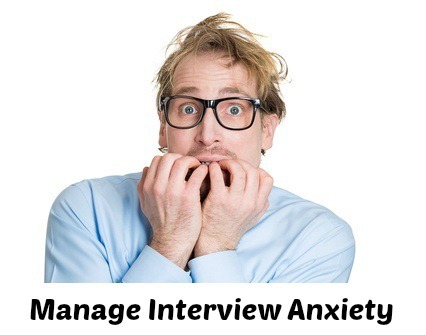 Overcoming interview nerves and anxiety is a key factor in your success. Interview stress can cause you to make job interview mistakes. These tips for interview success will reduce your nervousness and build your confidence, helping you to come across as the winning job candidate. 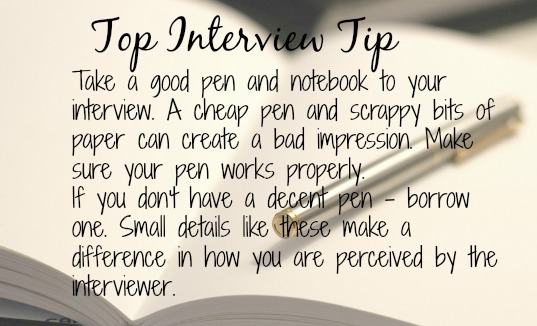 Read other top tips for interviews that may surprise you.